Shriram Divine City Kovil salutes the rich heritage of Chennai with a modern twist! The city of Chennai has a glorious and rich culture. It is indeed a jewel of south India. Yet, it is also modern and is embellished with a lot of global-styled structures. One area that is well-known is West Porur. This area is perhaps most popular due to its famous Amman Temple. This region has a whopping 1000-year old heritage and thus holds great pride amongst the residents of Chennai. The temple is flanked by the Bypass Road on one side and Outer Ring Road on the other side. Thus, this area is well connected to all parts of Chennai. This is where the next big bang project called Divine City Kovil is coming up. Located off Poonamallee High Road, this project is a great place to live a comfortable life at highly affordable prices. Shriram Divine City near Porur is actually only 9 minutes away from easy connectivity towards Central Chennai, IT parks, and major industrial zones of the city. The recently-made suave Porur Flyover will ensure a zippy ride to Guindy, Vadapalani, Manapakkam, and the airport as well. The coming times will witness a better infra and better connectivity, and hence this region is creating sure-shot excitement and promise for the real estate industry within Chennai. There is the upcoming monorail, CBIC Project, and Maduravoyal Port Expressway that will connect to the city centre within 15 minutes. 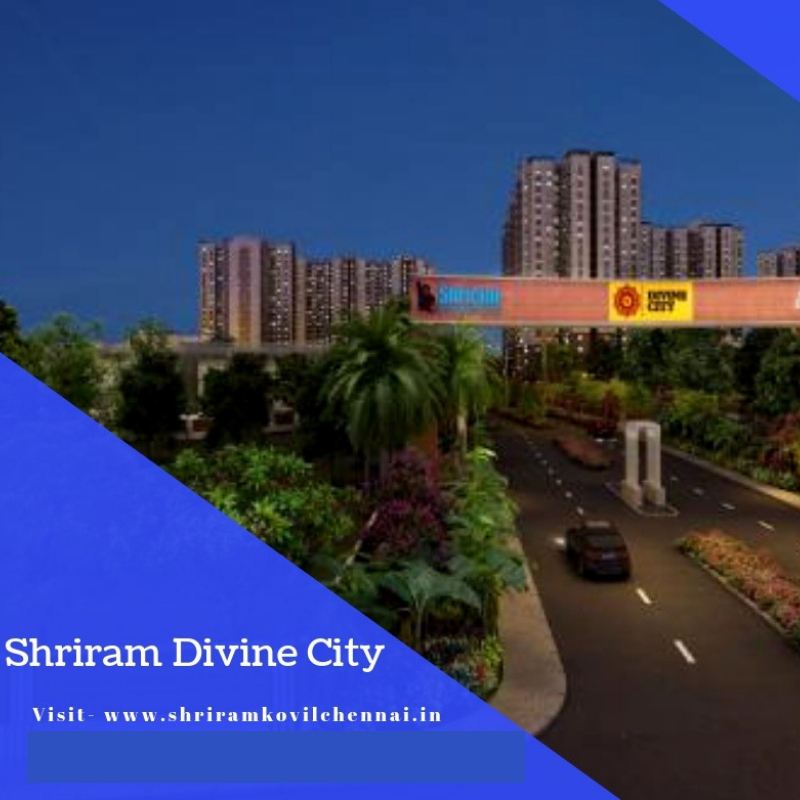 The Shriram Divine City price is an unbelievable. In the metropolis like Chennai, this is almost like a dream come true! The project is like a mini-city that is peaceful, green, laden with walkways, and recreational amenities. Swimming pool, kids’ play area, sports zones, centres for socialising, getting entertained, and relaxing are all part of this mini-city. The campus is totally secure and gated. There is a boundary wall enclosing this piece of paradise. This is the offering of the famed Shriram Properties, the realty arm of the reputed Shriram Group. The company came into being in 1995 and has since then delivered fabulous projects to over 16000 happy families. The brand has a strong presence in more than 5 cities and is growing its footprint. There is a wonderful opportunity for those who invest at the right time here. There are many early bird offers and discounts up for grabs! Then, easy home loans can be acquired for you. In fact, one can save up to Rs. 2.3 lakhs under Pradhan Mantri Awas Yojana by availing of loans at subsidized rates. The correct time to buy a property in Porur is now. It is sure to fetch high returns in the times to come as West Porur hosts rapid growth and development in the near future. The property is located at a junction from where all essential amenities are within a 7-km radius. This includes top hospitals, medical colleges, schools, engineering colleges, and many markets. Come, watch both your life and wealth become a lot more wholesome here! Just 10 Mins From Outer Ring Road. It Offers Great Connectivity to All Parts of Chennai. Take Porur Flyoverto Reach giundy 30 Min. I am raghunathan and to day I went to mangadu site and your g.m.sales given good reception and explained the particulars and I am very much happy and I invoke god Lord venkenkatedear to success your project at once.